Plastic pollution is a growing problem. Worldwide. Rivers, oceans, beaches, cities become more and more polluted with plastic. WasteBoards wants to turn the tide by involving as many people as possible, creating value from plastic waste. While having fun doing it. 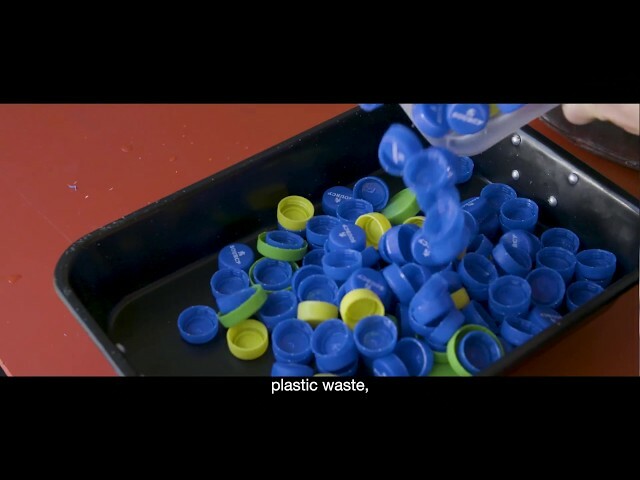 That’s why we manufacture high quality skateboards from plastic bottle caps. We collect these bottle caps together with the visitors of music events, school kids, companies, you name it. Each WasteBoard is made by hand. And each design is completely unique, because no single colour pattern is the same as any other. It is our aim to show people the value of plastic. To show that it is not waste but raw material for cool stuff. Although the problem is enormous, it is our philosophy to just get started. To create, produce and adapt along the way. As long as we move forward, towards a positive outcome. We start in Amsterdam but we want to create WasteBoards wherever it is possible and needed. We hope you wanna join the ride and support us. We start small, but we dream big. Today we bake boards in a shed. Next year we aim to have the first Mobile Skateboard Bakery in the world, collecting bottle caps at large music events. And how cool would it be to create WasteBoard bakeries in cities around the world, like the favellas in Rio de Janeiro or the slumps of Delhi? By doing so we want to raise awareness for the global plastic pollution problem whilst creating economic value on a local basis. We dream of a world without littering. And when we wake up, we want to be out of business. Whether it is technical support, networking or getting our supply of plastic caps we like working closely together with our partners to realize our dreams.